For our Siebel Unit I was making a demo which can search siebel accounts, displays a single account with the addresses and an insert page. The goal was to do this with the Siebel web service. This example gives an good example how to deal with complex web services, because the ADF Web Service Datacontrol only works with simple web services. You have a example on otn which use the ws datacontrol, but this only works on a simple web service method. When you want to search or create a new account you have to do more. This is how it looks. The search page show all accounts ( calls SiebelAccountQueryByExample ). In this example you can search on Id and Name. You can also click on the Id then the account detail page is loaded. When the detail page is loaded it calls SiebelAccountQueryById with the Id of the search page. I did this by making a web service proxy on the local saved wsdl. To test this web service you have to do a lot. This is to complex so I made it a bit easier. I created a java class where I call these ws methods and on this class I am making a datacontrol. I created an ADF Datacontrol on this class and use this datacontrol in the ADF JSF Pages. Because the input parameters of the ws methods are complex types, I had to create a bean with a method which returns the input parameter. In this bean I also added the search parameters field. getAccount is used in the pagedef as input parameter on SiebelAccountQueryByExample. Here is a guide with all the steps I did. And here is the jdeveloper 10.1.3.3 project. To let it work on your own siebel 8 you only have to change the url of the ENDPOINT_ADDRESS_PROPERTY in the stub file created by the web service proxy and put in the right username / password else you can't insert new accounts. 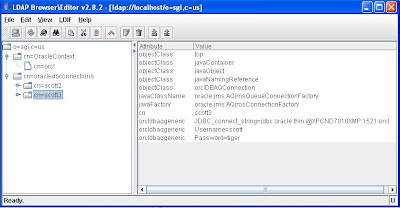 In this blog I will show you can use OpenLDAP to lookup your Oracle Net (tnsnames) connections or AQ connection factories. 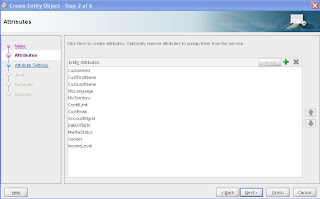 Now you don't need to have an Oracle Internet Directory (OID) installed. The first step is to download openldap. Install this and download my oracle.schema and put this in the schema folder of openldap. This file has to be included in the slapd.conf. Make sure anonymous can read the tnsnames entries. 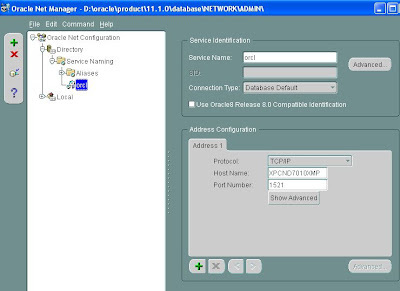 We have to configure the ldap for Oracle by making an OracleContext and oracledbconnections entry. I do this with ldapbrowser. You can download it here. For this free java application I made some templates which you can use. 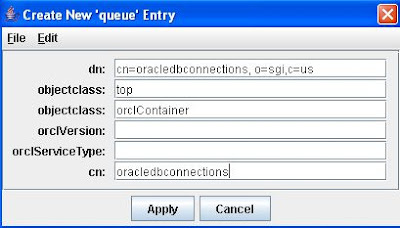 Do the same for oracledbconnections ( this is for the AQ entries) Now use the queue template in ldapbrowser. 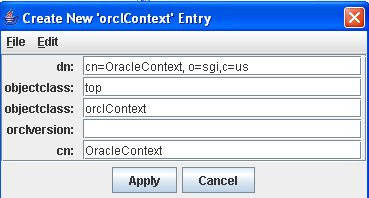 To make a tnsnames entry I select the OracleContext ldap entry and I use the orclNetService template to create a new Oracle connection. We are ready to use it, we only has to create ldap.ora in the network\admin folder. The ldap.ora looks like this. Now we can lookup this entry with standard jms calls. You can also use the ldapbrowser template. The entry look this in ldap. This I had this week a great coherence training for Oracle partners, where I learned a lot of interesting things about Coherence . This product is from tangosol ( Now owned byOracle ) and is a memory distributed data grid solution for clustered applications and application servers. You may think coherence is a very complex product but it is a very easy to handle. It does everything automatically like backing up the cache on different nodes, distribute the load and recover from lost cache servers or adding new coherence servers to the cluster. In this blog I will show how you can make a jsf employee search page on the coherence cache which get its data from a JPA datasource. Coherence runs above JPA. In this blog I will also update the cache entries with a salary raise and coherence will take care to update the right records in the employee table. 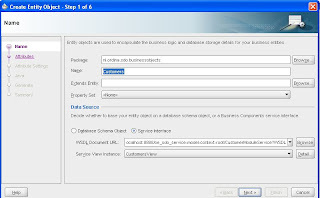 If you want to do it yourself you have to download coherence from Oracle. Add coherence.jar and tangosol.jar to the project libraries. Then we can create a entity bean ( entities from tables ( JPA / EJB3.0) on the employee table ( HR schema). 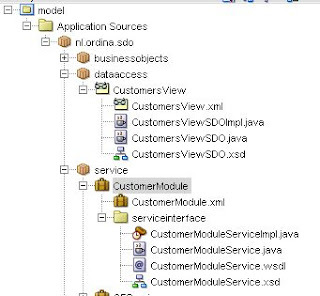 Jdeveloper create a persistence.xml which we have to change with the right class and database parameters. persistence-unit name must match with the property of JpaCacheStore in the coherence jpa xml. For searching through the cache for the right employees I use a filter. We invoke this by the following statement employees.invokeAll(AlwaysFilter.INSTANCE, new RaiseSalary());. Coherence updates the affected records. Here you can download the example project. You have to start 1 cache server on your network and you can start the webapp on different clients. Coherence connects automatically to the cache server. You can search the cache immediately. 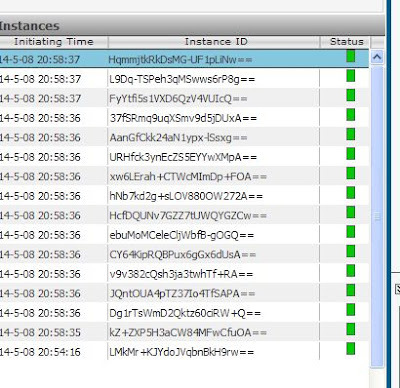 Start for example more cache servers and look at the timing. And update the cache by doing a salary raise on 1 webapp and query the changed employees in the other webapp. To run this example you have to change some files. Change the run options and the libraries of the project and off course the persistence.xml for the database parmaters. Oracle just released jdeveloper 11g TP4 in this release they changed some ADF things and there some bugs which you should need to know when you are a ADF developer. 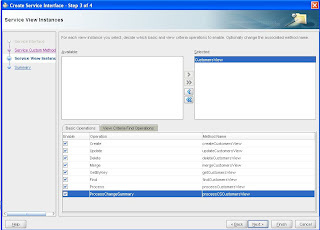 The changes are there is no ADF Create Form in TP4 ( See Steve Muench quote), to solve this drag the right create operation of the viewobject from the datacontrol to the taskflow. A method call is created, make sure this method call runs before the page is loaded and the page is now in insert mode. Steve Muench quotes "Notice that in TP4 there is no longer an "ADF Create Form" and that we're encouraging you to create a create form using a method activity that declaratively invokes the create operation, then forwards to a page with a regular ADF Form on it. This is due to the numerous confusions that have always surrounded the ADF "invokeAction" now that we have a visual, declarative mechanism to model this type of initialization activity, we will prefer users adopting that. Also, notice that the page definition for the method activity has the new "SkipValidation" property set to true." Andrejus made a create sample how to use a lov when the form is in create mode. If you don't do this you get validation errors and the lov is empty. A other issue is that the Commit operation fails with a table, you get a null pointer exception. This is bug in the JSF 1.2 reference implementation's validator tag (issue# 641): This issue is fixed in JSF 1.2_05. The TP4 release still uses JSF 1.2_04 that has this bug. The workaround to comment out the tag. In TP3 you could reference to a valuebinding of a other pagedef (Task Flow memory scope), this fails in TP4 but there there is a workaround you can update the DataBindings.cpx file with the right pagedef id. At the pageMap remove the package name part of the usageId attribute and at the pageDefinitionUsages element remove also the package name part of id attribute. Now everything works again. If you ever need to make a web application build on services ( because of SOA or it has to be demilitarized zone application) then you can use the new service based entity and view of ADF BC. With this it is easy to make a service based application and there are no differences with normal ADF database development. ADF BC can also create the sdo web service for you. 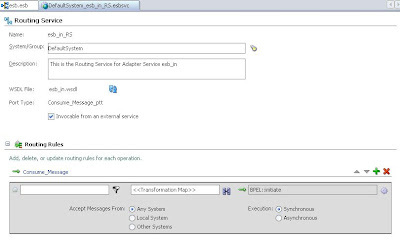 You can use this service not only for ADF BC but also for the new soa suite 11g. It can be an alternative for the the database adapter See my previous blog for more details. 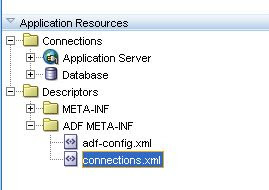 In this blog entry I will show you how to create a adf bc sdo web service and use this service in an other application. With 11g you can easily create a SDO web service. You only have to create a bc4j model project and add an entity with a viewobject. The viewobject which you want to service has to be added to the applicationmodule. The only thing you have to do now is open the applicationmodule and add a new service interface. When it finishes you see JDeveloper generates a few xml schema's and java classes. 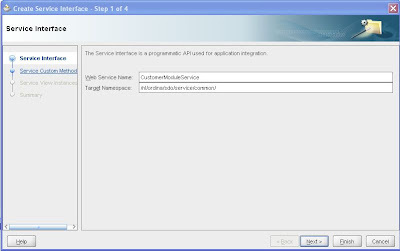 To test the new service run the ServiceImpl of the application module. This class is located in the serviceinterface package. We have to make a ADF BC service deployment profile. We can deploy the service to the local j2ee server. First start the oc4j container with JDEV_HOME/binoc4j.cmd -start. create a application server connection in your project and deploy this to this container. We have know two things, first we need our deployment profile name, this is CustomerService plus we add __MiddleTier. In my case the jndi lookup name will be CustomerService_MiddleTier. The second thing is the wdsl url this is http://localhost:8888/oe_sdo_service-model-context-root/CustomerModuleService?WDSL . Add the CustomerService_Common.jar to the project library. This jar is located in the deploy folder. And we can create in the last step an application and a viewobject. Now start the bc4j tester by running the applicationmodule and we see all the customers. We can use this application module in our jsf application. even when the first action of bpel is return true to the calling esb. It still waits until the whole bpel is finished. I had to create an asynchronous bpel process with a synchronous routing rule. Now the esb dequeues the next messages while the bpel is still running. 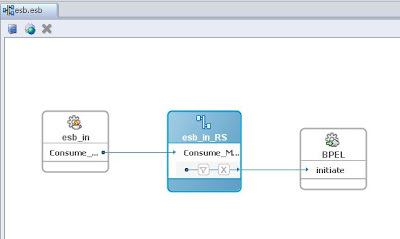 Here is a example of the esb and bpel process. First we add a jms adapter to the esb project. JDeveloper creates the adapter with a router. The next step is to create a bpel project and make sure you use the asynchronous option. In the bpel editor we first initiate the callback client and after that we do our business in my case we wait for a few seconds. We can deploy this bpel project to the soa suite server. We return to the esb project where we add a soap adapter. This soap adapter is the wsdl url to bpel process. Next we add a routing rule to this bpel web service. Now we can deploy this esb project to the soa suite server. If we add 10 messages to the queue we see that the esb does not wait now for the bpel process to finish. For a customer I'm busy with a proof of concept where we try to build a new message handling system. This MHS can already handle many and big edifact smime messages in a few seconds. The MHS also transforms the edifact messages to a xml. 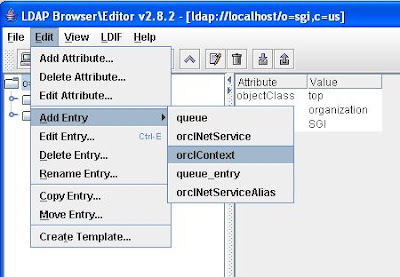 The second part of the POC is to use Oracle soa suite 10.1.3 especially the ESB part to deliver edifact xml messages to the right backoffice database. The ESB /BPEL needs a little bit tuning because the MHS handles a 500kb DELFOR message in a few seconds and the ESB takes more then a minute. 500kb edifact message leads to a 3.5Mb xml message. The soa suite server is a new Sun server with two intel quad cores with a lot of memory. First let me explain the esb processes. The esb /bpel process look like this. 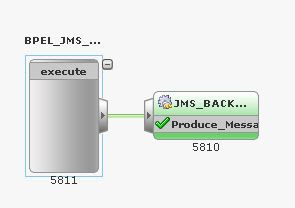 The esb reads the jms queue and gives the xml to a simple bpel process ( I did this to make sure that first the xml is inserted into the backoffice tables and after this process we can pass the incoming xml to the backoffice queue, so the backoffice database knows which messages are ready to process). 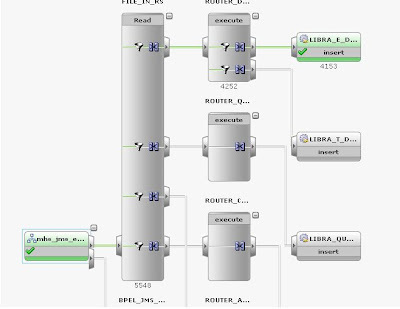 This bpel process calls two other esb process. Maybe this can be solved in only one esb process ,let me know if you know a solution. The first esb process reads the queue and pass the xml to the bpel process. 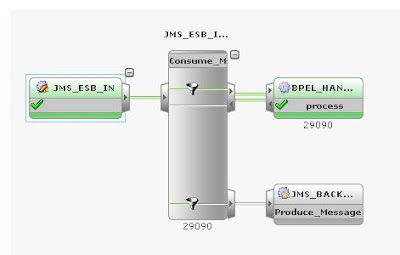 The last step of the bpel process is to call the last esb process which put the xml message in the backoffice queue. The total process takes about 55 seconds and our goal is to do this in 10 seconds. The first performance step is to replace the jms oracle database queue with a oc4j file persistence memory queue. We have won 10 seconds with this new queue. AQ with big xml's are not so fast as a memory queue. You can also use openjms. This is about 20% faster then OC4J. 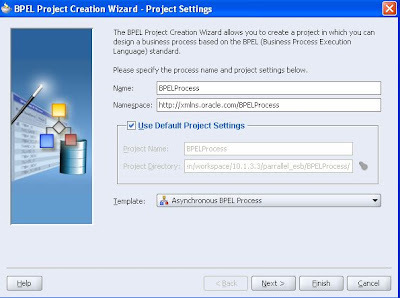 Let's look at the bpel process. This is a simple process so I only need to store the faulted instances. We add the following configuration part to the bpel.xml. We have won an another 8 seconds. So the total processing time is 38 seconds. Because the db adapter takes about 7 seconds and passing the xml to the database queue takes also 7 seconds. We have a overhead of 24 seconds. This is propably due to by passing the 3.5Mb xml with web services from esb to bpel and back to the esb. The last step I did is to pass only the run identifier to the backoffice queue and not the whole xml messages. Now the total process takes 23 seconds and the AQ part is from 7 seconds reduced to 10ms. The overhead is still 15 seconds. So next week I will try to tweak the esb web services. If you know how to do this let me now. This are the result with different delfor edifact message size. If we look at the result table we see that small xml messages are handled very fast and that 3.5Mb or 7Mb xml messages have the same total processing time which is very strange. Maybe soa suite handles big messages differently. The last problem I had is that the esb handles only one process and waits until this finish before starting the next process, because I have a server with 8 cores I want to have more parallel process else I only need to have two cores with a high clock frequency. This problem is also solved by making a esb router (which dequeues) and calls with a synchronous routing rule the BPEL process. The BPEL is now a asynchronous process where the first step is to report back to the esb and after this I am calling the other ESB processes. Now I see parallel processing and a 700kb delfor xml is processed in a second, the 3.5 mb delfor in 16 seconds and the 7mb delfor in 12 seconds. I had to remove the deliveryPersistPolicy from the bpel.xml else It won't process the bpel instances. You may already know that events plays an important role in Soa Suite 11g. 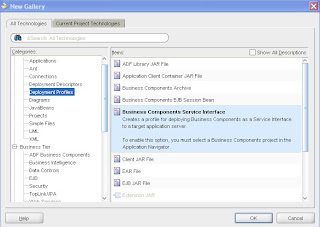 In this blog entry I will show how you can raise events in your ADF JSF application with ADF BC ( BC4J). 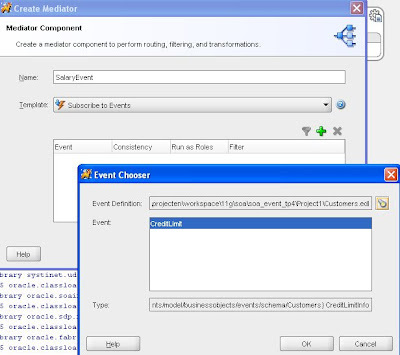 These events can be intercepted by a mediator of soa suite 11g and this mediator can start other processes. In my case I publish these events to a file. I hope with this blog you get an inside look how events works. The first step is to configure the entity in BC4J for events. In this example I use the customer table of the oe schema. 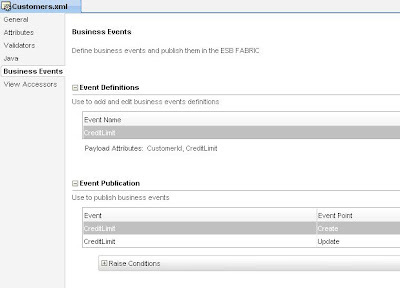 On this entity I add a CreditLimit event which fires for every customer insert or update. To this event I add two customers attributes, The customerId and the creditlimit( BC4J adds automatically the old and new value of these attribute ). Let's make a JSF page on this entity and publish this application to the Soa suite server. If you don't do this I don't believe the events will be intercepted by the mediator. The events are enqueued in the following queue edn_event_queue. This queue is located in your own soasuite schema. The published event looks like this. If I manually dequeue this queue the result looks like this. We are ready with ADF and now we can go to the soa suite part. We create a new soa suite project where we add a mediator. Select now the Subscribe to events template. and browse to the customer.edl which is located in the bc4j model project. In my case I add a file adapter and connect this file adapter to the mediator. The last step is to make a stylesheet mapping between the mediator and the file adapter. This TP4 release is all about events. Active Data Service, this is very interesting push framework. 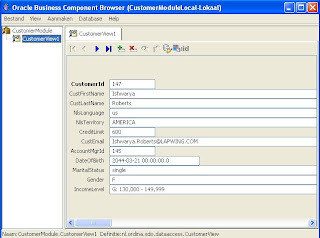 ADS refreshes the ADF bindings when the data source is changed. This data source has to publish events. BAM can be a data source which can publish event. MDS Metadata services, Customizing pages is more explained. 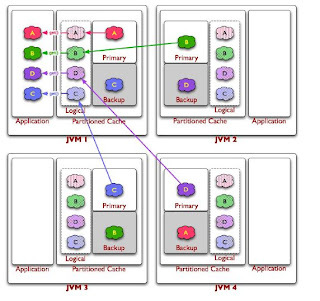 Event delivery network, A new Enterprise console and Business Rules is more explained and off course the J2EE edition of Oracle BAM. 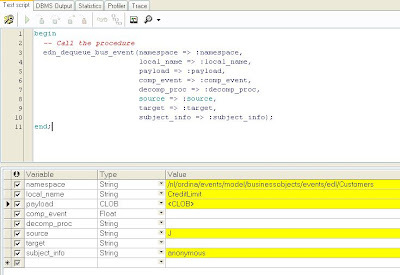 There is a lot to blog about especially about events and how to use this in ADF, Soa suite and in BAM. So check this blog and other Oracle bloggers for all the new details.